Nanotechnology can help capture carbon dioxide created during industrial processes and convert it to fuel such as methane. This process not only keeps a contaminant out of the air supply, but also turns it into a source of energy for the same factory. Imagine the possibilities if this process could be miniaturized to work on your car. One of the ways to use captured CO2 is to convert it into a combustible fuel such as methane (the natural gas many of us burn in our stoves). All you need to do to make this conversion is to replace the two oxygen atoms with four hydrogen atoms, resulting in CH4 (methane). At Penn State, a team of researchers is working on this method of turning captured CO2 into methane. 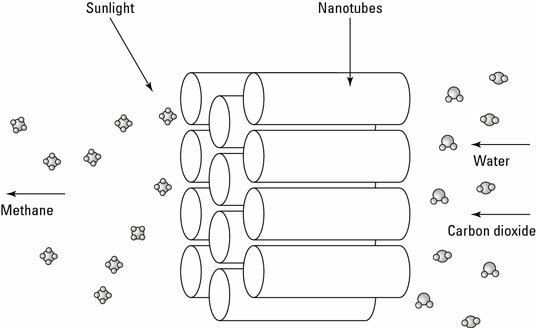 They use clusters of titanium oxide nanotubes coated with a catalyst that helps convert carbon dioxide and water into methane using sunlight as the power source. This approach could allow us to create methane from carbon dioxide, store it near a power plant, use the methane to generate more energy, take the carbon dioxide from that process to produce more methane, and so on in a so-called closed loop. Because this conversion would be powered by sunlight, the additional energy costs in turning carbon dioxide back to fuel to power a plant shouldn’t be significant. Of course, there would be capital costs to install the photocatalytic cells and the piping to deliver the carbon dioxide that was separated from the rest of the exhaust stream. According to Craig Grimes, the leader of the Penn State research group, this method might be used more broadly in the future by capturing and reusing the CO2 in our vehicles so that none of it is released into the atmosphere.